Greenleaf Book Group Press, 9781626344174, 272pp. Great leaders of change positively impact business performance by fundamentally working differently than most leaders in three ways. First, they change how they think and talk about change. Second, they change their approach to change by engaging both individuals and the organization. And third, they elevate what they do as a leader and the roles they play. In Change the Way You Change , authors R. Kendall Lyman and Tony C. Daloisio pull from ten years of research and working with individuals, teams, and organizations to convincingly illustrate how changing a team or a business requires changing both inside-out (thoughts and beliefs) and outside-in (structure and system) approaches. 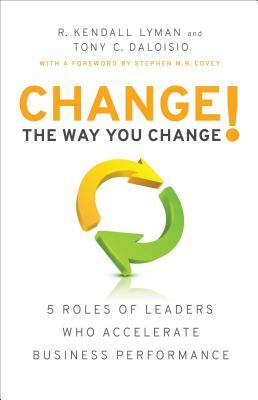 Each chapter provides an in-depth discussion of one of the five roles of great change leaders: focus, align, engage, lead, and sustain. And the main points of discussion in each chapter are bolstered by quotations, examples, exercises, and summaries. The only way to survive as a leader in the twenty-first century is to make change part of your leadership agenda. And that means making it a priority and getting good at it. Whether readers are beginners or experts, this book will help them change the way they change to accelerate their leadership and get results. R. Kendall Lyman is a founding principal of The Highlands Group, a firm specializing in strategy, organizational change, and leadership development. He helps leaders around the world to navigate change, improve employee engagement, and transform culture. Kendall lives with his wife and three children in the Salt Lake City, Utah, area. He holds a MBA from Brigham Young University. Tony C. Daloisio, Ph.D., is a principal of The Highlands Group, and founder/CEO of the Charter Oak Consulting Group (one of Inc. magazine's fastest growing privately held firms; see www.cocg.com). Tony earned a BA and Ph.D. in Psychology and Education from the University of Connecticut, and an MA in Counseling Psychology from Fairfield University. Residing in both Atlanta, GA, and Washington Depot, CT, Tony is married to Teresa Hargrave. They have two children and two grandchildren.